The bags are packed and ready to go. Everything is looking lush and green in the garden and you’re just about ready to launch into the long-awaited vacation. But wait – there’s something you forgot. Don’t get caught in the false lull of lush green in your summer garden. Although the recent rains have freshened and livened up our greenery, don't sink into garden neutral. We are at the threshold of summertime heat – great for beaching and barbeques but for the garden, it’s an entirely different story. So before you head out of town for the upcoming holiday weekend or ship off for vacation, set up a watering schedule with another gardening friend. Want them to still be your pal? Make it easy for them. Move your entire container plantings, which during this weather require at least two drinks a day into one shady area next to hose access. There’s nothing worse than dragging hose around the yard! This makes it easy to wand water plus the shade protects the plants from the intense summer rays, requiring less attention. 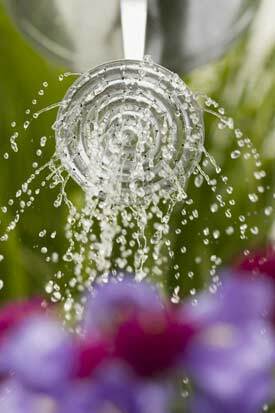 For any veggies, fruit etc., if you didn’t set up drip irrigation, you must stay on top of the watering to keep your crops going. Things can quickly wilt in a few days. If you did set up drip irrigation, set it on a timer but still have someone check in to make sure it is working properly. This is a 'just in case' so someone can aid in the watering if the timer thing goes drastically wrong. If you have newly planted flower beds, shrubs or trees, this is the season that can make or break the long-term success of the plantings. Do not rely on overhead irrigation. Too many people think this suffices - (that’s a no,) plus it can raise more havoc with diseases. Who wants to return to that situation? So don’t get caught in that false lull of 'everything looks just perfect'. Give your garden some supplemental loving. Regardless whether you are away or just off enjoying the sunshine, remember that your plants, especially the annual crops or the newly planted, require mucho attention during this summer phase. When Richard Moss, an expert on transformation states, “The greatest gift you can give another is the purity of your attention,” he must be thinking gardens, too! So pay attention to the watering regime. It’s all part of the supplemental loving for your garden. P.S. Where can I find one of these? 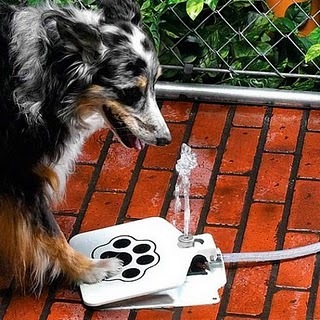 This should keep the pooches entertained and cool during the heat!